Summer of Ethiopian Music Continues: Krar Collective in NYC, Young Ethio Jazz in D.C.
New York (TADIAS) – The summer of Ethiopian music continues this weekend when the London-based Ethiopian trio, Krar Collective, make their U.S. debut appearance in New York at Summer Stage (Central Park) on Sunday July 21st. The event follows the live concert last week by the soulful duet from Ethiopia, Munit and Jorg, who performed to a full-house at Silvana in Harlem (see photos below). And stay tuned for Tadias Magazine’s exclusive video interview with Ethiopian-born, Grammy-nominated singer and songwriter, Wayna, about her upcoming show in New York at Drom on July 27th featuring her new album and video to be released in September. 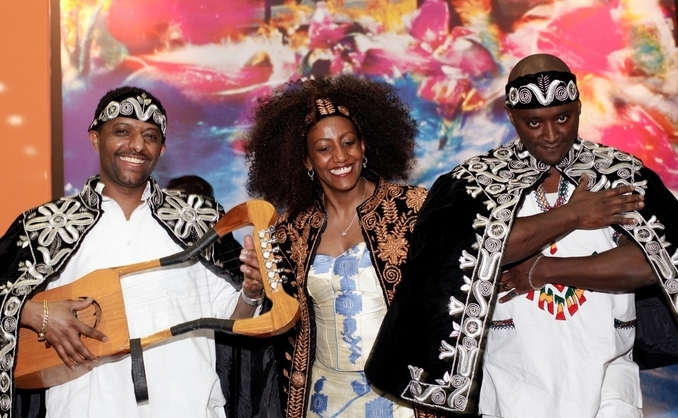 The new Ethiopian west coast sensation ‘Ethio Jazz Band’ made up of young musicians, ranging in age from 10 to 15, are scheduled to play during the 2013 Ethiopian Heritage Festival at Georgetown University in Washington DC next weekend. Members of the Bay Area-based group include Jacob Sirak (Alto Sax), Yonathan Estifanos (Trumpet), Paulos Thomas (Trumpet), Addis Getahun (Tenor Sax), Christian Tesfaye (Drums), Robel Gizachew (Bass), Semon Yacob (Keyboard and vocal), and Yohannis Dawit (Keyboard). And in Los Angeles, the local Ethiopian jazz ensemble, Ethio Cali, led by trumpeter, arranger and composer, Todd Simon, and other musicians from Southern California will be joined by a special guest from Australia, Ethiopian-born vocalist and massinqo player Dereb Desalegn, aka Dereb at the Grand Performances on Friday, July 26th. Young Ethio Jazz Band in D.C.